Released in March 2016, this statewide study examined the economic impact of Arizona's nonprofit sector, and a report titled Arizona Nonprofits: Economic Power, Positive Impact reveals the sizable contribution that Arizona's large and diverse nonprofit sector makes to everyday life and to the prosperity of our state. The findings debunk the perception that nonprofit organizations are a small component of the state economy, instead revealing a thriving and diverse network of social-purpose organizations—some 21,000 strong—that are a powerful economic driver. The research was conducted by ASU's Seidman Research Institute in partnership with the Alliance of Arizona Nonprofits, ASU Lodestar Center for Philanthropy & Nonprofit Innovation, and The Phoenix Philanthropy Group. Funding was provided by the Arizona Community Foundation, APS and the Industrial Development Authority of Maricopa County. A Social Media & Marketing Tool Kit has been developed for nonprofits to make it easy to share the report's findings in organizational communications. The materials in the toolkit include pre-written social media posts and pre-sized images, key messages, compelling quotes,sample newsletter content and a PowerPoint presentation containing the major findings, which can be customized for your organization's Board of Directors. By clicking the link below, you will download a zipped folder containing a PDF document and various image files. 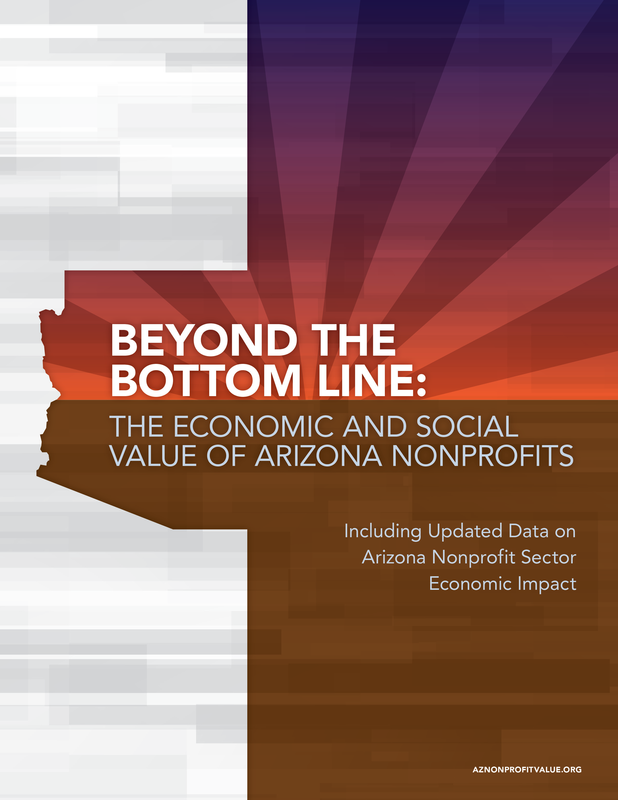 The second report in this series, Beyond the Bottom Line: The Economic and Social Impact of Arizona Nonprofits, examines the Social Return on Investment for Charitable Giving in Arizona, and was released on April 24, 2018. The true value of a nonprofit’s programs and services are far greater than economic impact alone. Expanding on the March 2016 study, the latest independent research conducted by ASU’s Seidman Research Institute on behalf of the Alliance of Arizona Nonprofits reinforces the economic importance of the sector while also providing new insights into the social, public, and civic value of nonprofit programs and services impacting such critical issues as workforce development, education, health and welfare, poverty alleviation, and community cohesion statewide. Additionally profiling seven nonprofits across the state who are successfully evaluating the outcomes of their programs and services, the report also suggests local research-based metrics to help nonprofits evaluate their own social impact. The report was supported by the Arizona Community Foundation, J.R. Hollon & Associates, InMedia Company, The Phoenix Philanthropy Group, Salt River Project, and others. The Social Media and Marketing Tool Kit developed for the initial report was so successful that a similar Social Media and Marketing Kit has been developed to allow you to easily share key points from Beyond the Bottom Line in your organization’s newsletters, Facebook posts, tweets, and other communications. As before, the toolkit includes pre-written social media posts and pre-sized images, key messages, compelling quotes, sample newsletter content and a PowerPoint presentation containing the major findings, which can be customized for your organization's Board of Directors. Click the link below to download a zipped folder containing a PDF document and various image files. Community forums throughout Arizona are now being held to showcase the results, which will also be made available online and in a limited quantity of printed versions. If you are interested in having a presentation in your area, please email Kristen Merrifield at kristenm@arizonanonprofits.org.